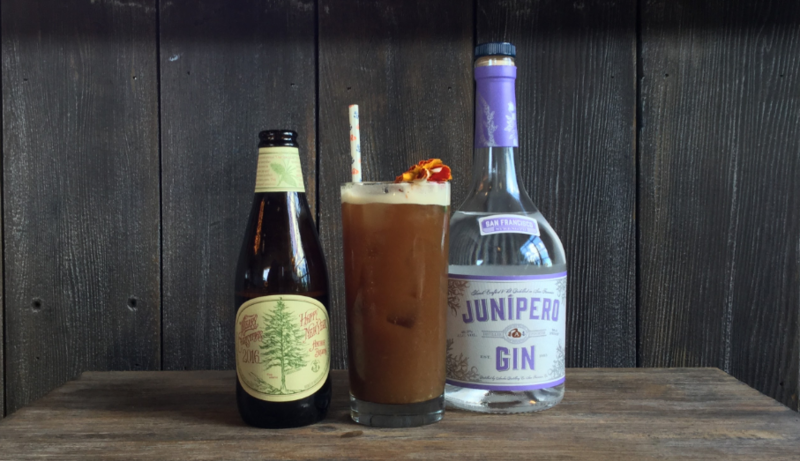 The holidays are in full swing and we’re celebrating with festive beer cocktails, featuring our 2016 Christmas Ale and Junípero Gin from Anchor Distilling! Our Anchor Christmas Ale is a highly anticipated seasonal delight with this year marking the 42nd annual release of this celebrated Anchor tradition. The ale’s recipe is different every year—as is the tree on the label—but the intent with which we offer it remains the same: joy and celebration of the newness of life. A deliciously smooth winter warmer with notes of seasonal spices and a malty backbone, this year’s ale is complex and full in flavor with a velvety texture and alluring, yet subtle, spiced aroma. Created in 1996 and celebrating its 20th anniversary this year, Junípero is America’s original craft gin. 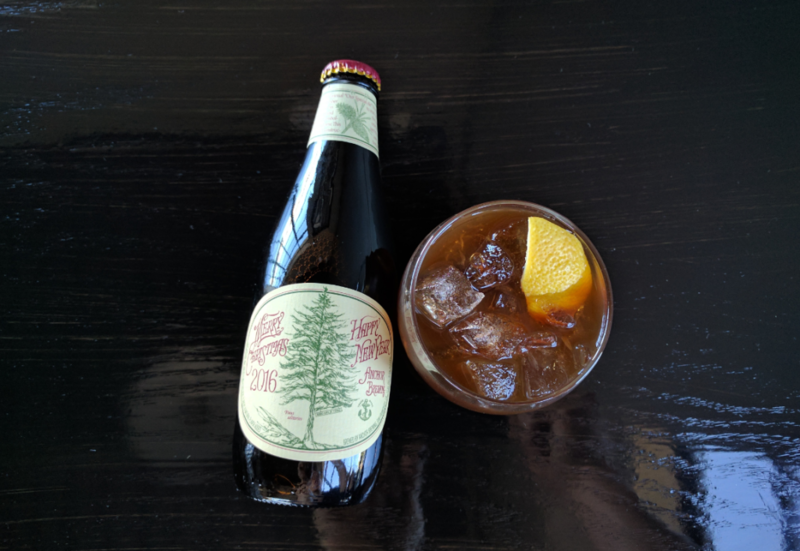 To create the secret proprietary recipe for Junípero, the Anchor Distilling team applied the knowledge gained from years of mixing herbs, spices and botanicals for Anchor Brewing’s annual Christmas Ale. The result is a distinctive, intriguing complexity in Junípero Gin that is light, crisp and clean, combining a deep and mysterious spiciness with subtle delicacy. 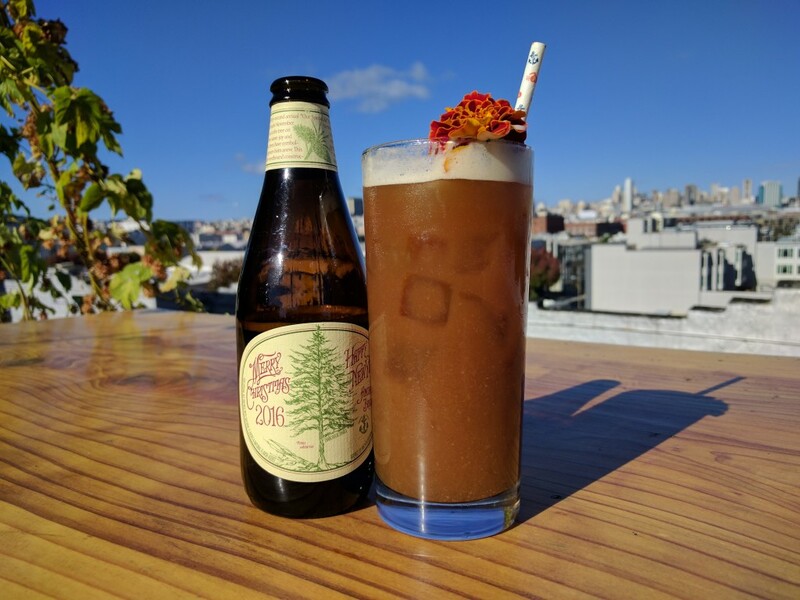 Enjoy these holiday beer cocktail recipes, created by our friend Raul Ayala at Dirty Habit. We wish you Happy Holidays from the brewers and distillers at Anchor! Cheers! Xmas in Juniper is rich, yet refreshing with velvety spiced stone fruit notes. Inspired by a delicious Fizz with elevated seasonal flavors. Representing winter in a glass! * Spiced Apricot Syrup: In a saucepan, combine 20 oz of Apricot purée, 13 oz of sugar, 3 oz of organic earl grey tea, 10 juniper berries (crushed), 10 green cardamom pods (crushed) and a pinch of salt. Makes 33 oz. In a shaker, mix all ingredients except for the beer. Dry shake vigorously to activate the egg whites. Add ice and shake for about ten seconds. Double strain cocktail in an 8 oz glass and top with beer. Garnish with an edible flower. The 42nd Round is a spirit driven cocktail inspired by the seasonal flavors. Enjoy balanced layers of spiciness, bitterness and sweetness all around, highlighting notes of chocolate, spices and malt. *Simmer 2 parts beer to 1-part honey until a syrupy texture is created. Mix all ingredients in a mixing glass and stir for 15-20 seconds. Strain over ice (a large rock if possible). Garnish with citrus peel expressing the oils over the cocktail. To find Anchor Christmas Ale near you, use our handy Anchor Beer Finder to search by style and location. To find Junipero Gin, contact your local Anchor Distilling spirits distributor, using the list here.